Our steelhead are suffering and need your help! I have started a fundraiser called Flies For Fins. I don't want your money, but I do need some of your time and tying materials. I am working with Reaction Fly and Tackle, Pacific Angler, Michael and Young Fly Shop and Whistler FlyFishing to raise money for the Steelhead Society. Each location will carry a cork board that is full of steelhead flies MADE BY YOU. These flies will be sold at the shops, where proceeds will be donated to the Steelhead Society. In the middle of each cork board will be a graph that is updated weekly to show how much money had been raised. This is for a great cause, please choose to take some of your time and flies out of your box for it. 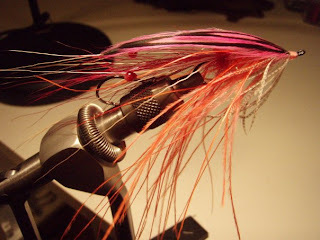 I will have a Face Book page up in the next several days for Flies For Fins, however, we need flies RIGHT NOW. Feel free to send one fly, or ten! Make them as fancy or as plain as you would like. Please include your name. Envelope, stamp, fly. It's that simple. Please do your part and help us make a difference! As many of you are aware, our beloved Thompson River remained closed this fall for steelhead fishing for the first time EVER! 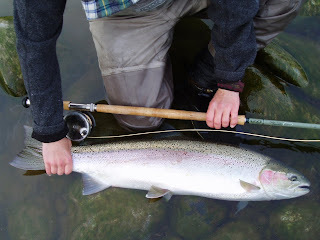 While there is always debate about the exact causes of the declining runs, there is a strong movement right now amongst BC steelhead angers to work together for these fish. In the past, user groups have become distracted by personal agenda and old arguments (i.e. gear vs fly), and this has made actually accomplishing anything extremely difficult. The Steelhead Society of BC has been rejuvenated in the past few months, and the current members are making a concerted effort to bring all anglers together. A chance for all our voices to be heard at once. Most of us are well aware that steelhead stocks in B.C. are. declining and that very little help is being given to these fish from the government. In light of the upcoming Provincial election, at their monthly meeting, the directors and officers of the Steelhead Society agreed, that there is an important window of opportunity for all BC steelheaders to voice their displeasure with the mismanagement of steelhead stocks. We feel that a mass e-mail campaign is a great way to start the ball rolling. The provincial election is scheduled for May and politicians have their ears open now, more than at any other time, to the voice of the voters. Below you will find a copy of all the current BC MLAs’ email addresses, including those of the premier and the opposition leaders. On Feb. 1, 2009 we are asking all of you who are concerned with the plight of steelhead in the province to email a letter to every MLA in the province. A deluge of e-mails voicing the concerns of voters on one day cannot be ignored. Again, Feb. 1, 2009 is the day. Below is a brief form letter that can be copied and pasted, making it easy for those who are pressed for time or not quite sure what to say. It is recommended that people try and write their own individual letters as those do hold a bit more weight than a form letter. Jason Tonelli, the President of the Steelhead Society, will be writing a separate letter on behalf of the Society that further outlines our concerns. This is a chance to grab the ears of those in government that we should not pass up. We strongly encourage all who are willing to participate to spread the word of this e-mail blitz. As a steelhead fisherman in British Columbia, I am extremely concerned by the provincial government's complete neglect of the plight of this great fish. Thanks to a steady pattern of government cut backs, there is an incredible lack of core funding available for this resource. After an election promise of the “the best fisheries management, bar none” I would have expected to see more funds made available for protection and enhancement of steelhead in the province. Instead I have seen the opposite. The number of people assigned to steelhead management throughout the province has dwindled to an embarrassing few. A mere fraction of what there once was. Once there were more people working on steelhead management on Vancouver Island then there now are in the in entire Province. ''The best fisheries management bar none''? I am still waiting for that to happen. 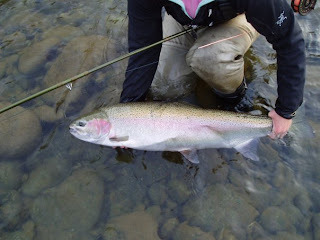 Steelhead are an extremely valuable recreational sport fish. To many, the pursuit of them is a way of life! I, and a multitude of others, travel all across this great province in pursuit of steelhead. Along the way we spend money in local tackle shops, hotels, pubs and restaurants, often in small towns during off-peak seasons. Gas is put in vehicles; boats and motors are purchased. All of this money is spent in the pursuit of steelhead, providing employment and income to local BC residents and businesses. For many of these businesses, steelheaders are the major source of income for much of the off-season. Anglers travel from all over the globe to come to BC and fish for the largest wild steelhead to be found on earth. Will they (and the funds they bring) still come, once the steelhead have been ignored into extinction? The amount of money that recreational fishing contributes to the provincial economy is very significant, but if the fish disappear, so too will that revenue. It seems that the economic benefits of the recreational angling for steelhead are totally ignored by the government when it comes to investing money into the fishery that generates such considerable value! The government insists anglers purchase a fishing license and a steelhead tag in order to fish for steelhead. This should mean that the government is responsible for steelhead, yet the government is ignoring this responsibility! The anglers of this Province have long been fighting for this fish, spending their own money and time with little or no government support. Is this government willing to increase the funding for steelhead protection? Funding for more staff dealing with steelhead issues, funding for necessary habitat work, funding for studying, and stocking steelhead. These fish are in dire straits and need the government’s help. The party that commits to support these fish will be the one supported with a vote from me! Thanks, You should see some flies from me in the near future. They would be from the Great Lakes...they should work though, shouldn't they? First rant of the year.